The rest of this content is restricted to Choice Literacy members. For the past 30 years, Andrea Smith has learned with children in Texas, Colorado, and Indiana before finally landing in Ohio. Her third and fourth graders spark a new energy for teaching, and she is grateful to spend each school day with so many fascinating learners. 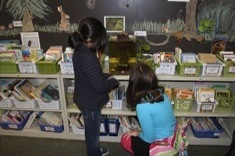 Andrea Smith discovers the value of more creative nonfiction book tub titles after listening to ideas from her students. 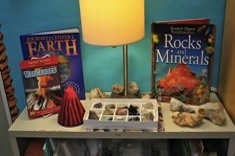 Andrea Smith shares some of her favorite nonfiction classroom displays. Andrea Smith shares her best advice for library design that celebrates nonfiction as much as fiction. 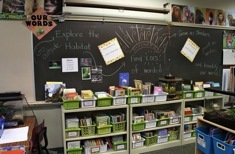 In this five-minute video room tour, 4th grade teacher Andrea Smith from Dublin, Ohio shows how she builds a classroom community and much of her literacy curriculum from the care and study of unusual pets. 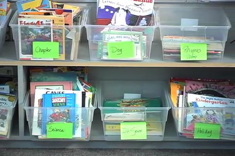 In this time-lapse video, Gail Boushey and Joan Moser help Carrie, a second-year teacher, begin to organize her classroom library according to themes and traffic patterns in the classroom. Are your meeting area wall displays too cluttered? 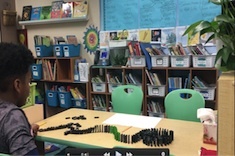 "The Sisters" (Gail Boushey and Joan Moser) help a 3rd grade teacher rethink her wall displays and meeting area in this ten-minute video.